I've joined the more than one tattoo club. A few years ago I didn't think I was even gonna join the club. Praise Him that I did. I'm pretty convinced that I only know like six people without tattoos. And definitely convinced that the best people I know have tattoos. Most people my age do have them, so for all those in my life that tried to convince me that Grandmas don't look good with tattoos: Are there even gonna be grandmas without tattoos? I mean...? In the words of one of my favorite people, I ain't taking this body to glory with me. Caleb and I got to sneak away to Seattle for the weekend and I fell even more in love with the Pacific Northwest. More on that later. 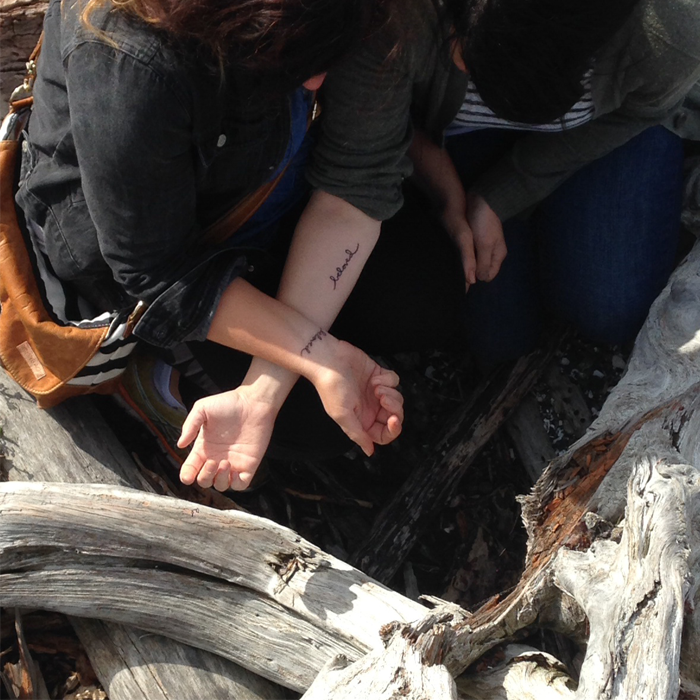 We stayed with some of our best friends, Carina and Nick, and had the awesome idea to get tattoos. Carina and I actually always have this idea and by the time we're 80 we will both probably have full sleeves. 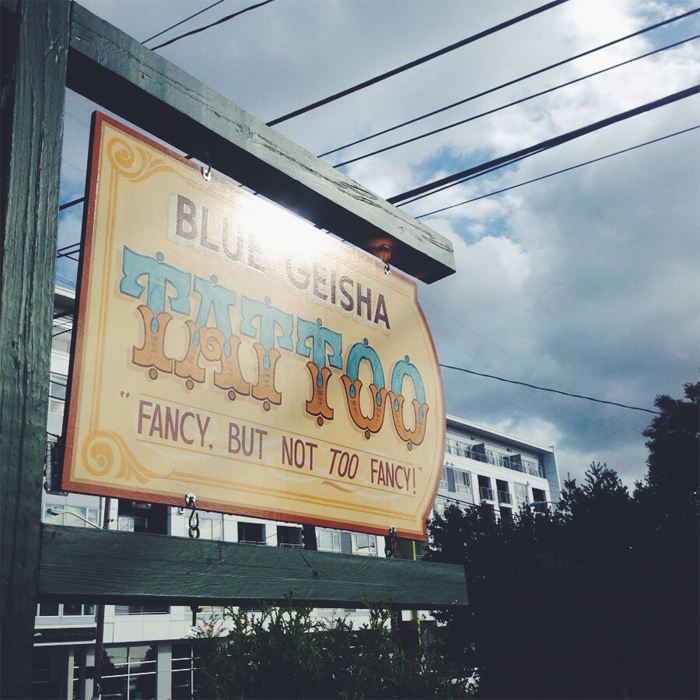 We almost got them a few weeks earlier in Florida but we held out til Seattle and stumbled upon Blue Geisha tattoo. Which sort of just screams Carina and Danielle, don't you think? Especially that tagline. I can barely breathe looking at this photo. Blue Geisha is in West Seattle which I am head over heels for. We grabbed lunch at Marination and consumed the most amazing Kimchi rice bowls, the kind that dreams are made of. I made Carina write beloved seventy two times until it was just perfect for both of us. 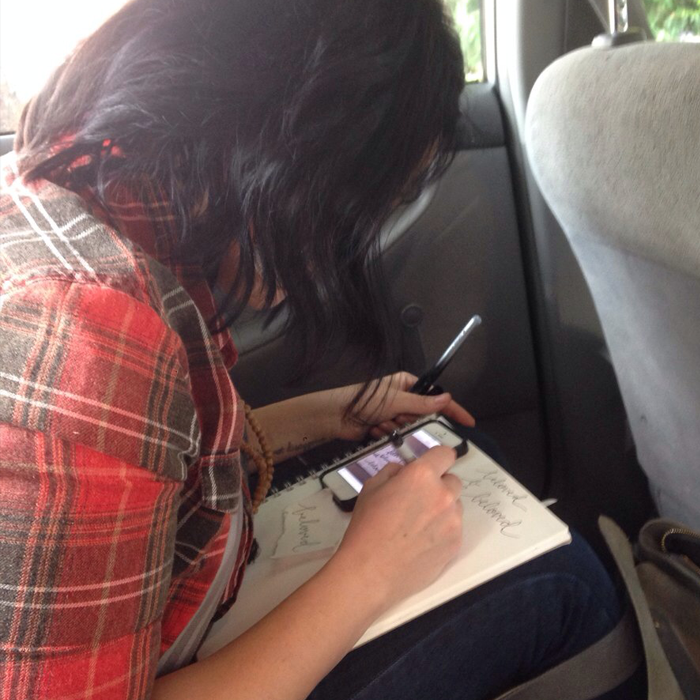 She's an artist, her handwriting is on my body, and we're forever tied to one another. She's stuck with me for the long haul. In the car on the way to the tattoo shop, we like to keep things spontaneous and last minute. We felt mildly nauseous and nervous on the way there, and there was some debate over the sizing and negative space on our sketch, so we did what anyone would do and made our husbands go first. Yes, it's true, our husbands were getting their very first tattoos together that day. They also got the same word. But they are blood brothers and I could cry about how much they love each other. All of our nerves went away when Nick busted out with How long would it take for me to get one too? to the tattoo artist, and actually followed through with getting one. You know all those sayings that are like the-absolute-least-likely-thing-to-ever-happen-in-your-life-at-that-very-moment, ALL OF THOSE were running through our minds and suddenly our dainty tattoos felt like the sideshow to the fact that Nick was getting tattooed right then and there. We love you Nick. Best day of our lives. The forces were against us that day for things like having to relieve the babysitter, Caleb's tattoo taking like six times longer than we imagined, the emergency break being stuck in the car I was driving on the highway, thunderstorms, and so on and so forth. But nothing was stopping us, we were in it to win it. Please request Joey at Blue Geisha. Tell him we sent you. Thank you. Beloved means lots of things to me. It means dearly loved. Esteemed, darling, precious, favorite, worthy of love. It means the God of the universe has chosen to love us, not because of who we are, but because of who He is. We are his beloved. I am His. I also have these beloved friends that have taught me more about Christ, and myself, and what friendship looks like more than I could have ever hoped for. We're unperfect people refusing to give up on each other. My chosen family, my heart, my beloved. Don't mind the first day, molting, look. The second tattoo was such a different experience for me. For weeks I starred at my first tattoo and thought everyone was starting at it as well. I looked at older women's arms and imagined a feather on them. I'm about to pee myself imagining me doing that a couple years ago. For reals, people. I did. Second tattoo: I barely look at it or notice it's there, have hardly followed up with my aftercare directions, and have no life altering thoughts about it. Just happy dances. All around. Lots and lots of them. so...normally I read beloved like "BE-LOVE-ED" right...until I saw it on your arms...I have no clue why I read it differently, but I read it "BE LOVED". That's totally a different meaning, but I think I like it better. I love your matching tattoos! I'll check out Blue Geisha, I"m looking for a new peice myself! your spontaneity makes me nervous. ha! i have never been brave enough to venture into the heat of the moment tattoo business. it took me 4 years to decide what i wanted and another 6 months to bite the bullet. 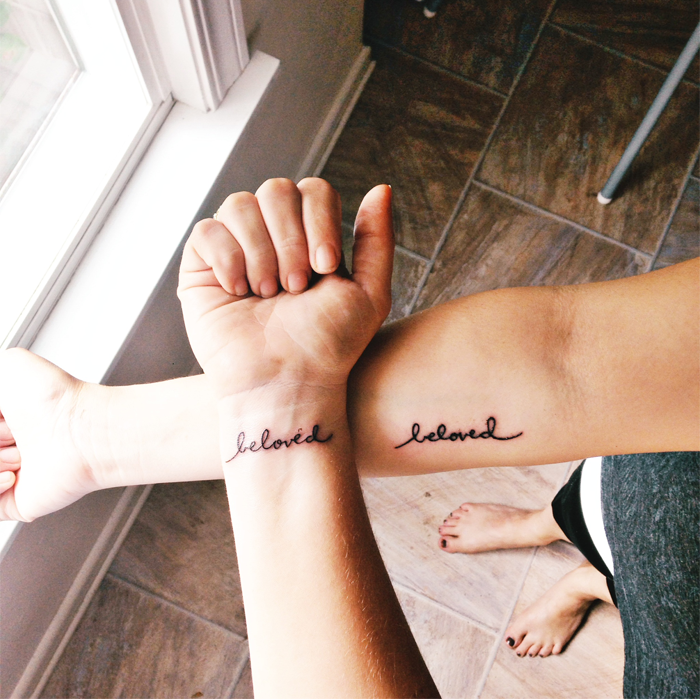 but i love the meaning, the handwritten font, and the friendship that surrounds your new art. check all 10th and 12th class results at bharatresults.org.